Twitter users in Ghana have forced American media giant CNN into changing serious misrepresentations of the country following its coverage of the country's recent elections. Using the hashtag #CNNGetItRight, thousands of users slammed CNN for a story riddled with factual and spelling errors, in addition to painting Ghana in a very bad light. A few minutes later, the journalist issued a rallying call to his over 165,000 followers, writing: "My Ghana people. Shall we do something [to] let @CNN know we are tired of their lazy reportage of our election? Tweet them with #CNNGetItRight"
By 10am, the hashtag had jumped top of Twitter top trends in Ghana. By mid-afternoon, Ghana's most influential tweeters in entertainment, bloggers, film and even the first lady, Lordina Mahama, had joined in. The country’s elections, widely praised by local and international observers for going smoothly despite anxiety because the results were not announced as quickly as many wanted, had consistently drawn unfavorable reports from CNN. On the day of the polls, the network's website had done a story headlined: 'Ghana elections: 5 reasons why Ghanaians don't trust the process', despite the fact that reviews about the Electoral Commission's performance on voting day itself had been widely positive. But the article that drew real ire was one published on December 9, titled 'Ghana election: Incumbent concedes to Nana Akufo-Addo’. The errors brought ridicule from Ghanaians, who got even more annoyed when it emerged that the article was written by a Nigerian journalist based in Lagos, Stephanie Busari, and another based in Atlanta, Ralph Ellis. The article, among other errors, also incorrectly said the people of the country are 'Ghanians', instead of 'Ghanaians'. In addition, the story even got the final results wrong. It said: "Akufo-Addo of the New Patriotic Party won 5,180,389 to 4,193,861 or about 55% to 45%, reported representatives at the EC National Collation Centre which verified results sheets from 241 constituencies." This was inaccurate because the EC's account of 241 constituencies gave Nana Addo 54.69%, and John Mahama 43.60%, so it's surprising the network quoted that number. Another factual error said that Ghana’s president-elect, Nana Akufo-Addo had contested a general election in 1998, when elections were actually contested in 1996 and 2000. Hours after the hashtag continued trending in Ghana, it began trending in Lagos and Nairobi as other African cities, who had also previously suffered biased reportage from the network, also picked it up. But even after these corrections, there are still mistakes. As at the time of writing this report, the current story says John Mahama belongs to the "National Democratic Party", when he belongs to the National Democratic Congress. Joy FM's Gary Al-Smith said he did not expect this explosion when he started the hashtag. "Of course I was unhappy about the reportage but I did not think it will gain traction the way it did", he tells myjoyonline. Narrating how he came up with #CNNGetItRight, Gary - who was part of JoyNews election coverage as its social and digital media analyst - said a friend, Yao Mensah Nyalemegbe, had alerted him to the article of the CNN piece to him early Sunday morning on Facebook. "Having already noted how skewed CNN's television and online coverage had been before the polls, I simply took to Twitter and played around with a few hashtags like #CNNStopTheBias and #CNNDoBetter in my head. In the end, I settled on #CNNGetItRight"
Many influential Ghanaian Twitter users helped make the hashtag trend very quickly. First Lady, Lordina Mahama, was clearly not amused, tweeting: "#CNNGetItRight we are a beautiful and thriving country. Kindly report accurately on us." Jemila Abdulai, a blogger who covered the elections for Ghana Decides, was also key in pushing the network to amend its story. She began her deluge of tweets with ". @CNN, you guys really need to stop making things up when you've nothing real to report.This ain't make believe #CNNGetItRight #GhanaDecides"
Host of Joy FM's "Drive Time," Lexis Bill described the report as concoction in his tweet. "So CNN your reporters sat in Lagos and Atlanta to concoct this shameful fallacy and you approved it. Unbelievable. #CNNGetItRight," he tweeted. Super Morning Show host Kojo Yankson weighed in: "Er... Good Morning CNN. Your journalist is either incompetent or racist. I see no third option. Either way, fire them! 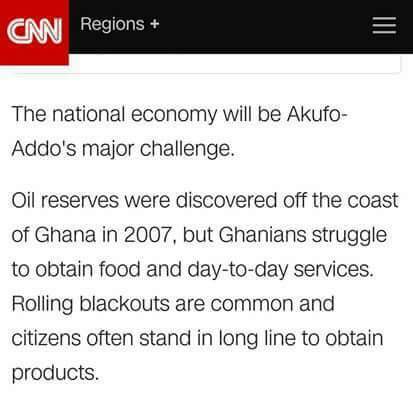 #CNNGetItRight"
This is not the first time CNN has been lampooned for its unpalatable coverage of Africa. In August 2015, a senior executive of the network was forced to go to Nairobi to apologise for coverage calling Kenya a “hotbed of terror” ahead of Barack Obama’s earlier visit in July. Many Kenyans were outraged by the report, which suggested Obama was likely to be attacked during his historic visit to the land of his father’s birth. While the country has suffered a string of atrocities by the Somalia-based al-Shabaab militant group, most of Kenya does not resemble the parts of the world where terror attacks are commonplace, stressed Kenya’s active Twitter community at the time. The hashtag #SomeoneTellCNN trended for several days ahead of the US president’s arrival, visit with users deploying a mix of humour and satire to criticise the American network.